A lot of hullabaloo is made of the ‘flight to safety’ in ‘investor’ circles, a rising price of the US Treasury bond or rising exchange rate of the US dollar is a ‘flight to safety’. Suddenly ‘risk assets’ become a bit too risky & there is a rush to sell for the ‘safest’ securities. Even a rising gold price is considered a ‘flight to safety’ at times but then when the gold price falls it’s suddenly ‘risk off’. This scenario doesn’t make a lot of sense, either gold is safe or it isn’t & why are ‘investors’ worrying about US dollar devaluation one minute & eagerly bidding for it the next? The whole concept of ‘safety’ is a false premise, maybe dreamed up by some turkey at the Bank of England decades ago, or some such, to obfuscate the real reason. What drives the ‘money’ markets is not ‘safety’, or ‘risk on’ or ‘risk off’ but ‘profit‘. A good analogy is water flowing down a hill, it follows the path of least resistance. In the case of the ‘money’ markets, it can be described as the ‘money’ follows the path of easiest ‘profit’. So what is this ‘profit’ & where is it coming from? The ‘profit’ is rising prices on financial ‘securities’ – bonds, notes & bills – particularly, though not exclusively of the government variety. The ‘profit’ is coming from government, through its central banking arm. As GSI’s Keith Weiner describes, US Treasury bonds (also Japanese, British, Australian, in fact government bonds of most ‘developed’ nations) have been in a ‘bull market’ since at least 1982. By ‘bull market’ is meant rising prices. As an ‘investor’ in government bonds you would have been unlucky not to have made a healthy ‘profit’ from your ‘governments’ at any time in the last 30 years, almost a generation. Central banks are the ‘purveyors of profit’ in the ‘money’ markets, after all, they issue the currency, they are the market makers. There has been no more consistent ‘profit’ made than in government bonds for the last 30 years. How so? Easy, central banks either lend against or buy outright large amounts of government bonds for their own ‘portfolio’, they bid up the price (denominated in their own obligation) of government bonds. As I alluded to in the paragraph above however, central banks are not restricted to government bonds, they can & do manipulate ‘money’ market spreads by bidding for ‘private securities’. They can, if they wish, hand easy ‘profits’ to ‘investors’ in bank bills, corporate debt & even ‘equities’. I’ll give you what I think are two good examples of the ‘money’ following the path of easiest ‘profit’, though I’m sure many more can be found. The first is the recent earthquake & tsunami in Japan. Upon the news, the Yen began to soar against many other currencies, silver fell 6-7% in the space of a few hours, gold was well down, as were share- markets & not just in Japan. It is incongruous that a devastating natural disaster, killing tens of thousands of people & destroying property & livelihoods would have ‘investors’ rabidly bidding up the Yen – natural disasters lead to an increase in productivity? I read how it was Japanese institutions ‘repatriating’ their overseas investments for reconstruction & so on but a more logical explanation was a move to ‘front run’ the ‘big easy’, the Bank of Japan. The Bank of Japan is notorious for its ‘easy money’ policies. I have no doubt that ‘investors’ speculated on the BoJ ‘easing’ in response to the disaster, that is, they would bid up bond prices & not just government bonds. The ‘investors’ would buy low & sell high. If you go back to 1995 you will see similar moves in the Yen, right about the time of the devastating Kobe earthquake. Speculating on central bank ‘profit’ has been around for a while. The second is the very recent announcement by the Fed of ‘Operation Twist’. Upon announcement of the Fed buying, so bidding up, longer term government bonds – gold, silver, oil, share-markets & currencies, in fact you name it, lost their bid against the US dollar & government bonds, particularly the 10 & 30 year. The reason is obvious, ‘investors’ speculating on easy ‘profits’ in the government bond market, as Keith Weiner says “engineered by the Fed”, the ‘investors’ would buy low & sell high. Having said all this, there is one issue I haven’t addressed & that is as Keith Weiner also says, “the money comes from the capital account of the bond issuer. The speculator carries the bond on the asset side of his balance sheet. The issuer carries it on the liabilities side. No matter whether the issuer marks the liability to market, or not, the loss is taken.” The bureaucrats in Treasury & central banks are neither alchemists or gods, they cannot transmute lead into gold or water into wine. Certainly they can steal the “bread from the mouth of labour” but still, the loss must weaken the credit of the government, there is no way around this. Yet ‘investors’ still rush to bid for government bonds when they think, or know, central banks are handing them easy ‘profits’. This just reinforces my point, ‘investors’ care nothing for safety, the concept is bogus. ‘Profit’ is where it’s at. It is tempting to speculate that the game will continue until no more ‘profit’ can be given, when the yield curve flattens to a point where it just cannot flatten any further. 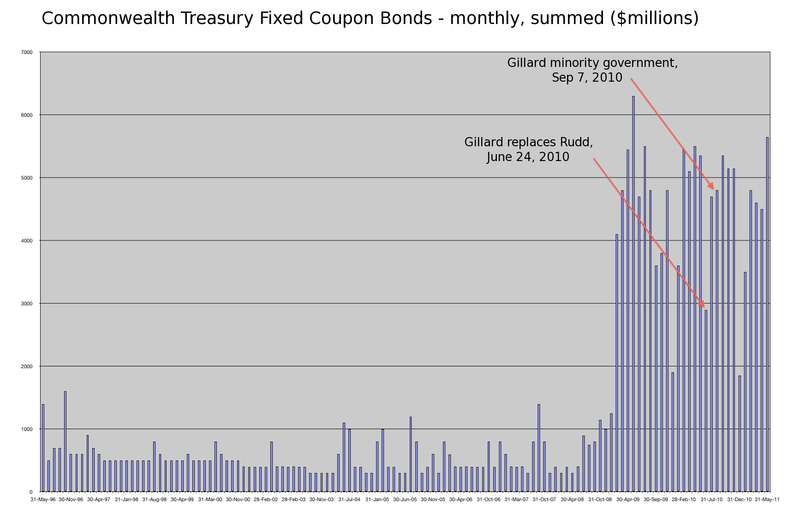 Can the government issue 30yr bonds with a 0% coupon (no ‘profit’ there) & their credit remain ‘money good’? I guess we’ll find out but I suspect the rising gold price since the Bank of Japan’s overnight rate hit 0% for the second time in 2000, is saying that it won’t. Who owns our nearly $200 billion public debt? It’s a question we’ve asked before. 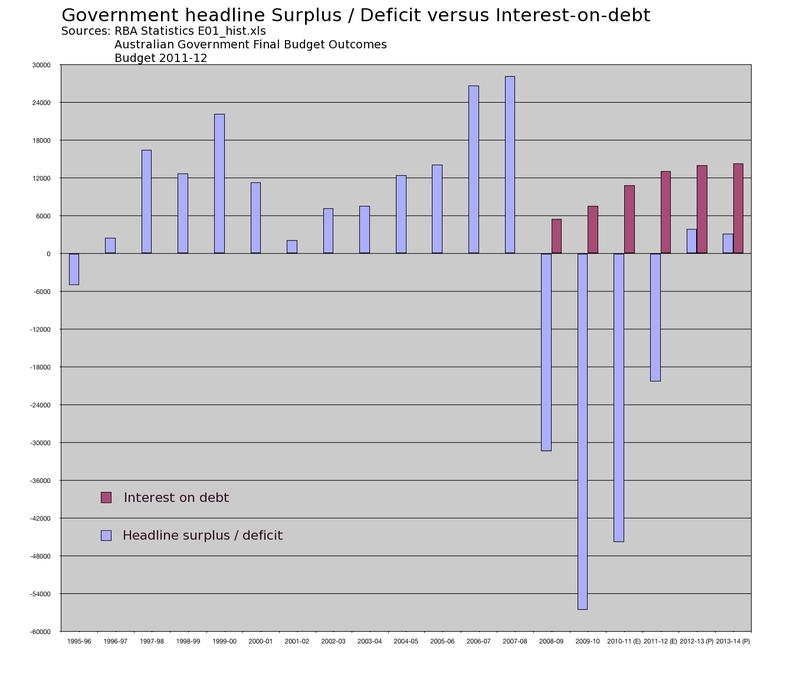 You thought the pollies had done little else but spar about deficits and debt? Sorry, different debt. 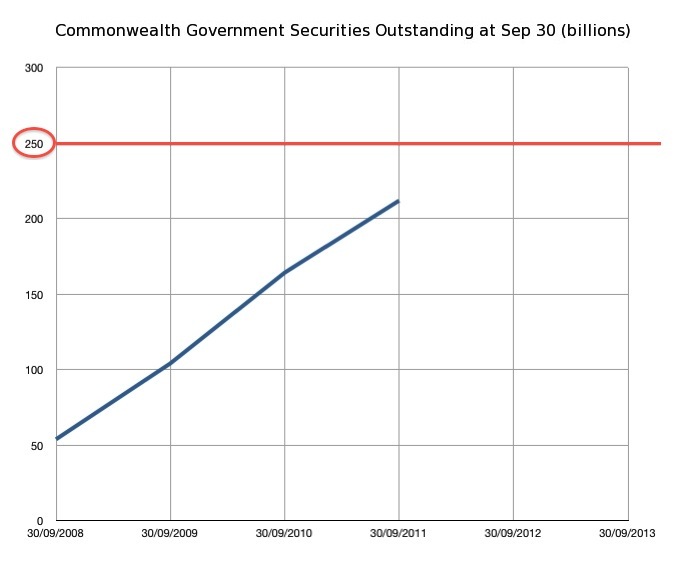 They’ve been arguing about the public debt – the amount the federal government owes (mainly to Australians). A search through the RBA’s Statistics tables easily proved Gittins wrong. 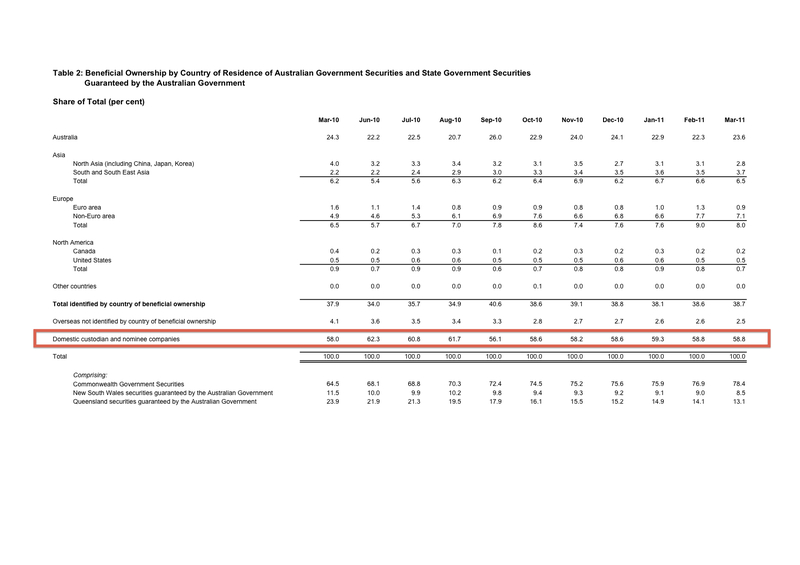 We found that at September 2009, an estimated 63.3% of public debt was held by non-residents of Australia. On April 24th this year (“Who Owns 73% Of Our Debt?“), we checked again. At December 2010, 72.6% of public debt was estimated to be owed to non-residents of Australia. 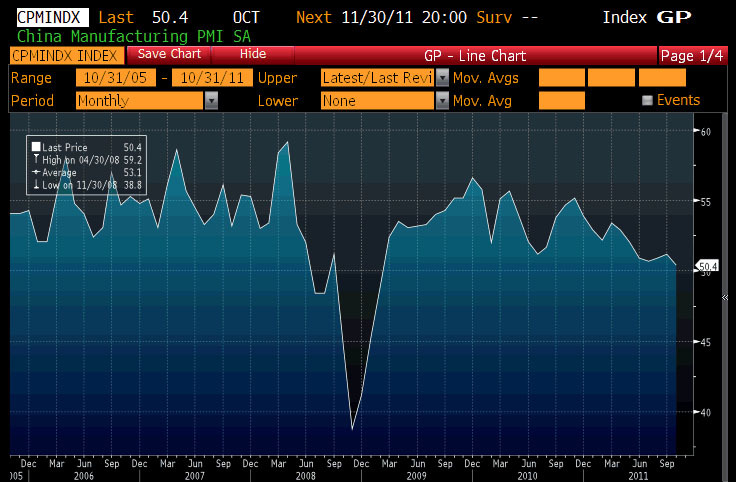 The RBA’s data has been updated again. According to them, we owed an estimated 73.13% of our $183.794 billion in public debt (at March 2011) to non-residents. So, just who are these “non-residents”? Not even the Australian Office of Financial Management. That’s the government department that “manages Australian Government debt, cash and financial assets”. The [Guarantee of State and Territory Borrowing Appropriation Act 2009] Act requires the AOFM to establish, and publish on its website each quarter, a register recording the beneficial ownership, by country, of all securities issued by the Commonwealth and any securities guaranteed by the Commonwealth that are issued by Australian States or Territories. … contains no provisions to compel the provision of information to the AOFM by the beneficial owners of securities or by persons holding securities on their behalf. This has limited the information available to the AOFM to form an opinion on the beneficial ownership of the securities. The figures in the tables represent opinions formed by the AOFM based on limited information. The AOFM does not believe that they provide any indication of the likely distribution by country of the beneficial ownership of securities held by custodian and nominee companies, or are representative of the distribution of the beneficial ownership of the total securities on issue. To ascertain the country of beneficial ownership of the securities covered by the legislation, the AOFM has reviewed where possible the ownership records of the registry or depository systems in which they are held. The AOFM has reviewed the name of the accounts which are registered as holding these securities and from this information and knowledge of the business identified sought to form opinions on the country of domicile of the beneficial owners. However this information is insufficient to ascertain beneficial ownership where securities are listed as held by custodians or nominees. So, the Guarantee of State and Territory Borrowing Appropriation Act 2009, and the Public Register set up in accordance with it … is utterly useless. As you can see, according to the AOFM’s “opinion”, 2.5% of our public debt is held “overseas not identified by country of beneficial ownership”. And according to their “opinion”, a whopping 58.8 per cent of our public debt is held by “domestic custodian and nominee companies”. In other words, by locally-registered ‘shelf’ companies with a PO Box address. Companies that exist in name only, and are officially owned by ‘nominees’ on behalf of unnamed, anonymous beneficiaries. Labor has hocked our nation up to the eyeballs to … God only knows who. Mind you, it is rather curious that the almighty RBA has somehow managed to “estimate” that 73% of our debt is held by “non-residents”. Especially when the AOFM’s official “opinion” (with a big disclaimer) is that they can only identify the country of beneficial ownership of just 38.7% of our debt. 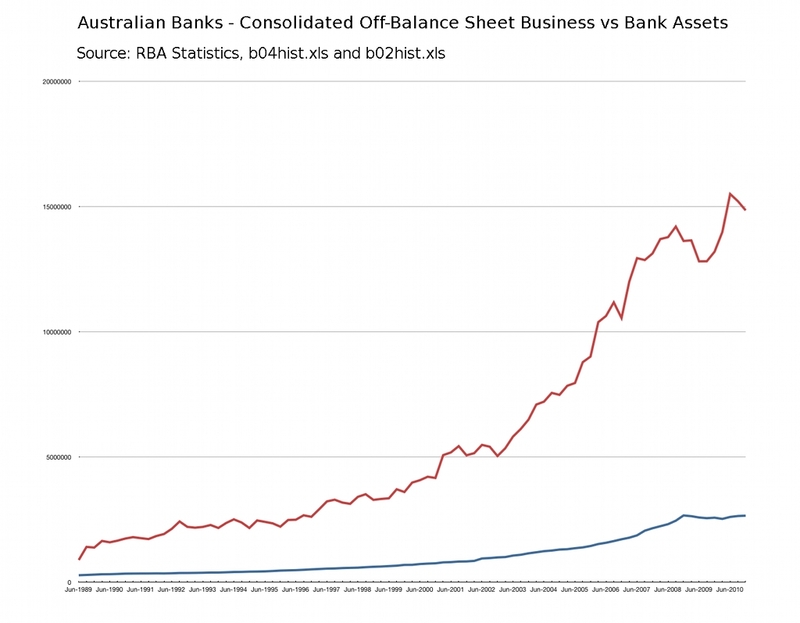 I say that this Labor government, the AOFM, and especially the “independent” RBA, have an awful lot of explaining to do. An ancient proverb says, “The borrower is the servant to the lender”. I for one think that the citizens of Australia have the right to know exactly who our government is rendering us as servants to obey. A quick, important note about that last chart. The last 4 sets of columns (year 2010-11 through 2013-14) are only Labor’s “Estimates” (E) and “Projections” (P). Since Labor came to power, every year their official budget “estimates” and “projections” have ended up, in the Final Budget Outcome, worse than originally “estimated” and “projected”. For example, their “estimated” and “projected” Interest-on-debt blew out by $5.69 Billion in just 6 months, between the Mid-Year Economic and Fiscal Outlook (MYEFO) report in November 2010, and the recent May Budget 2011-12. I will express a view here that is, as far as I can tell, being laid out by few others. I can’t claim the idea as my own, rather I have put this together based on the thoughts of Doug Noland, my favourite economic analyst by a country mile, who publishes the Credit Bubble Bulletin. I have taken the liberty of lifting quotes directly from his articles, they are in italics throughout my article, though I may have changed his wording just a little to fit in with the flow. Readers of the Gold Standard Institute know that money is what extinguishes all debt, nevertheless, credit1 can be considered a monetary equivalent or ‘money good’, take for example, Real Bills that mature into gold. Inextinguishable debt, as in irredeemable dollars and dollar denominated debt, are not money since they are, well… inextinguishable debt. Despite this contemporary irredeemability, credit is still considered to be in a dynamic state of ‘moneyness’, driven by the marketplace’s perception of safety and liquidity, and any meaningful definition of contemporary ‘money’ must include government debt instruments. The situation prevailing today is that key developed economies are locked into a perilous cycle of massive non-productive government debt expansion. Rather than the global money markets being composed of Real Bills, generated through the drawing of short term bills against consumer goods actually required by consumers, we have money markets where for nine quarters now, government finance has completely dominated system credit creation. These ‘marketable’ debt securities now absolutely dominate the world. Just how massive has this increase in government debt issuance been? I draw your attention to the charts below. As you can see, government debt issuance has reached levels never heretofore imagined. 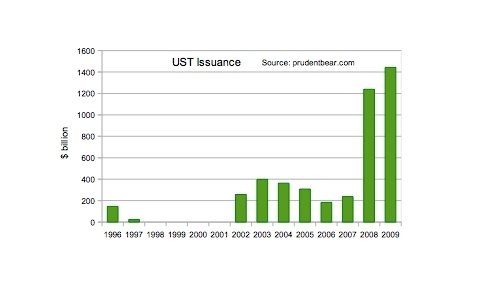 UST issuance reached almost $1.5 trillion in 2009. While the dollar amount of Australian government debt issuance is small in comparison to the US, the pattern of expansion is the same. I have included Australian government debt issuance back to 1985 to give some perspective of historical issuance. I don’t have figures pre 1996 for UST’s, nor 2010. Nevertheless, you get the picture. Why the fuss? Because it is the ‘moneyness’ nature of government obligations that they enjoy special treatment in the marketplace. Readers of the Gold Standard Institute also know that when it comes to the ‘moneyness’ of credit it’s not just quantity but quality that counts. I think it safe to presume that government debt has not improved in quality since 2008, yet issuance has exploded with little perception that government debt is being mispriced, over-issued, and misdirected. There is an ever expanding gulf between market perceptions of ‘moneyness’ and the true underlying state of government credit. In simpler terms, government credit is a bubble, a precarious Credit Bubble at the heart of our monetary system. Just as the US financial system doubled total mortgage debt in just over six years during the mortgage/Wall Street finance bubble with little perception of the underlying quality of U.S. mortgage credit, the financial system is now on track to double federal debt in about four years. The situation is no different in Australia and I doubt it would be different in most other ‘developed’ countries. There is only one true arbiter of the value of government debt, its only extinguisher… gold. Irredeemable dollars, being the obligation of the central bank – not money, cannot extinguish government debt. Is gold reflecting the expanding gulf between perceptions of moneyness and the true quality of government credit? Should holders be loaning their money – gold – for irredeemable government obligations, as if ‘buying’ mortgage credit at the height of the Wall Street bubble? Should the dollar price of gold be falling? I think not. And we all know what happens to bubbles. Note: 1. Remember, one person’s debt is another’s credit. I use the terms interchangeably. * Stay tuned for JMD’s follow up post, on the Reserve Bank of Australia’s sale of 2/3rd’s of Australia’s gold during the Asian Financial Crisis of the late nineties. 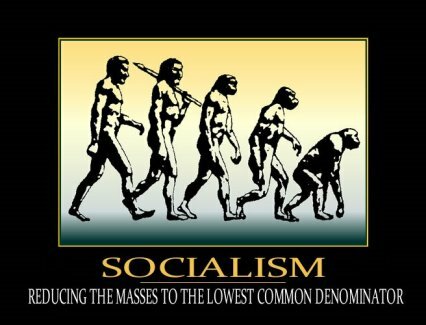 Labor’s “Building the Australia Devolution” continues. 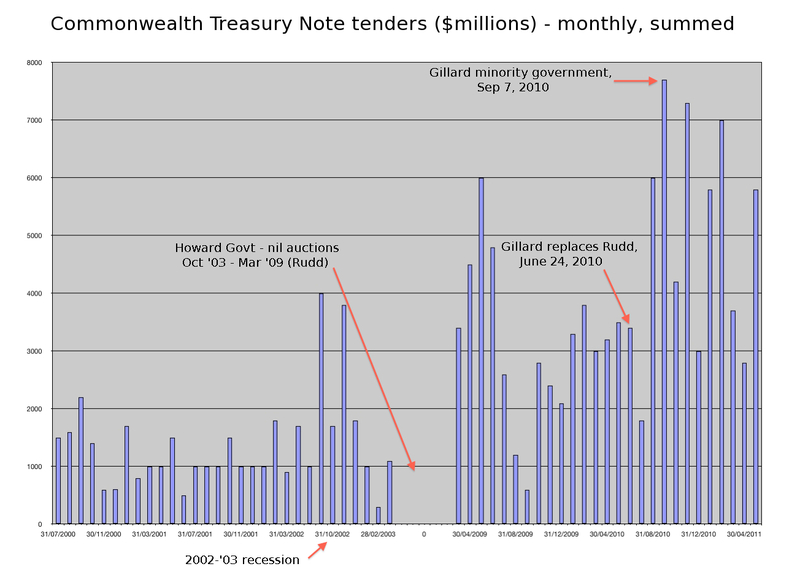 Three weeks ago – $2.2bn more debt. Two weeks ago – $2.4bn more debt. Next week – $2.5bn more debt. Labor seem determined to shatter the glass of their newly revised $250 Billion debt ceiling. At this pace, possibly by around the 3rd week of August.